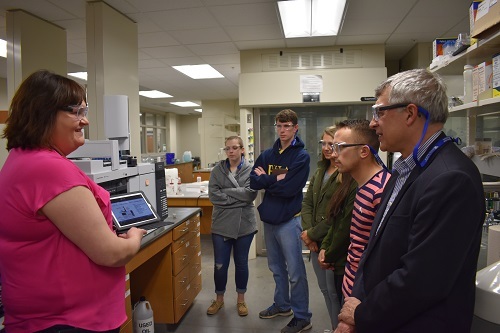 An environmental chemistry lab class under the direction of Dr. David Fraley of Georgetown College toured the UK CAER on Wednesday, April 25th. The focus of the visit was to introduce them to the working principles of the Dual Detection SimDist-MS through the use of visual training modules. The instrument was purchased by the BEC group through NSF award no. 1531637. The students then took a guided tour of other CAER facilities including the biofuels lab, dry room, gasification building, spinline building and the greenhouse. I consent to University of Kentucky Center for Applied Energy Research collecting my details through this form.